One of the best comments I have ever read. This is a comment about this post. Come to think of it, the Roman Collar is one distinguishing visible sign for a priest, for a bishop. 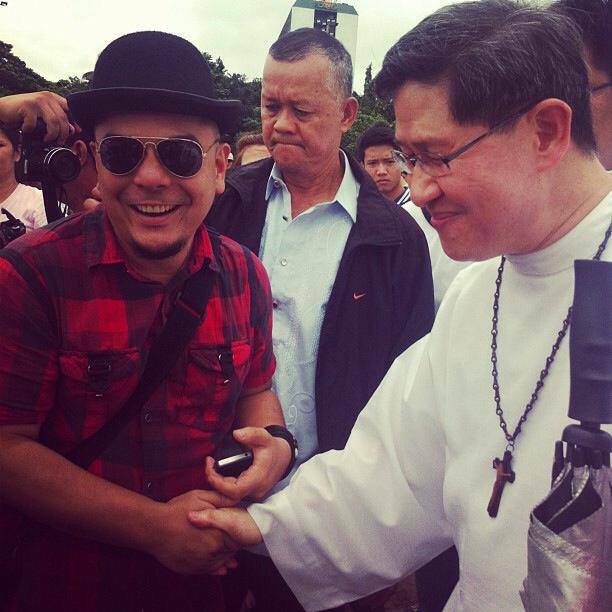 I hope our Filipino clergy will come to their sense to return to their proper decorum. I noticed that the younger clergy are the ones beginning to wear this way. The hippie, 1960s clergy who are slowly fading away are those not dressing this way. We hope that what we see on the outside is in fact a reflection on what is in the inside. 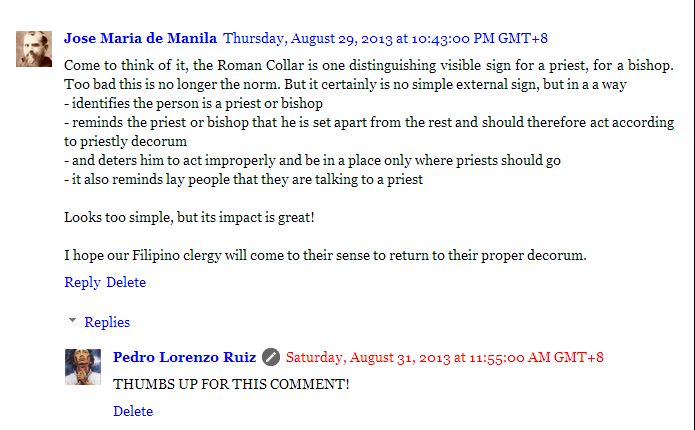 Kudos to Jose Maria de Manila for that comment. 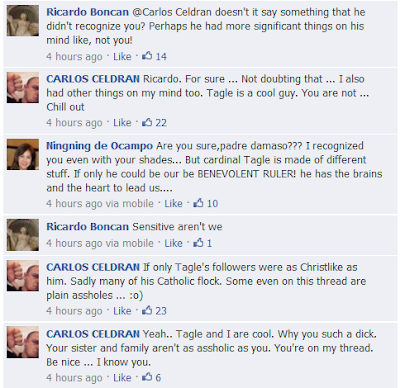 The Pinoy Catholic is for clapping! Commentator announces before the Mass that there will be no liturgical dancers. The people saw no altar girls in the procession. 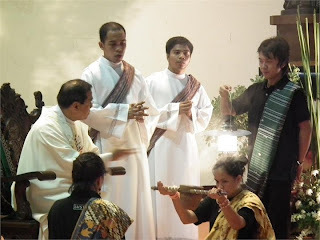 The altar servers were wearing white surplice over their clerical collar less black cassock instead of the barong even though they did not just come from a wedding or the camisa chino, even though they did not just come from a cultural show or the monastic alb even though they are just young boys who do not belong to the monastic order. The one carrying the Book of the Gospels is the deacon and NOT the lector. No EMHCs were in the entrance procession. Priests were not wearing chasu-albs. The organist who loves drum sets when playing the organ was late so the organist who plays the REAL organ substitutes. There are only 4 EMHCs to assist the priest for the regular Sunday Mass Attendance of 200. Any song by Hill Song or Don Moen is conspicuously absent. Include that "I Will Sing" and "Christify". The sound system got busted in the middle of the priests homily laden with jokes and made up stories. The priest announced that there will be no Communion in the Hand allowed because there is no more SARS and the quote from St. Hippolytus was taken waaay out of context, and that Communion on the Tongue while kneeling will be the only mode of reception. The priest also announced that known Masons, Feminist and Dissenting nuns, active homosexuals, pro-contraception and pro-abortion politicians will be BANNED from receiving Holy Communion. When only bread and wine were offered during the offertory. When the priest did not deviate from the liturgical texts. There was no hand shaking during the exchange of the Sign of Peace. The upbeat and happy tuned versions of Lamb of God was replaced by a more solemn and somber tuned version. The priest announced that there will be no clapping allowed after he says "The Mass is ended." In other words, if bishops, priests, deacons, and lay who act as lector, altar servers and EMHC do what is expected of them, not deviating from what the liturgical books says or contemplates, then we would all be happy and worshiping God as Holy Mother Church does and wills it. There are a few moments in the Liturgy that people are "allowed" to clap. This even happened even before the liturgical reform of Vatican II. Name the three moments that this is allowed. Everyone is going gaga over being an instituted acolyte, both for those who claim to be one and those who dispute the claim. Well, I ma throwing my hat into the fray, so please answer this question. Before you are instituted, what certifications do you have to present? Hmmmm? Pedro, I would like to ask for your prayers. My church is a traditional Anglican parish seeking to secede from that awful body and come into proper Catholic Truth. Pray that we don't drown as we begin our swim home! And this became the title of the book of another popular convert. Please pause and say a prayer for my friend. Please say three Aves for him and his family. It will mean a lot for me and for him. Sorry, I can't find yet a photo of Pope Francis with arms extended like that of the pope emeritus. GULP Alert: I almost fainted seeing this! A friend from confirmed that this happened. This happened during the #MillionPeopleMarch at the Luneta. 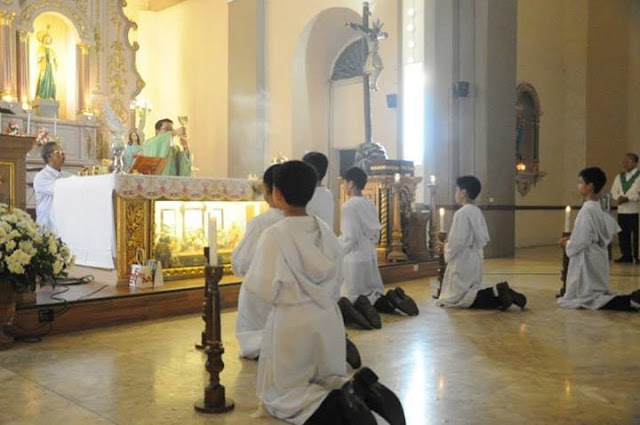 Surprisingly, sans the portable altar or table, with the Mass celebrated on the concrete floor of the grandstand, the Mass was "solemn" and no unnecessary movements and noise around that you can even find in an ordinary Sunday Mass inside a church." I asked him that the "solemnity" is still no excuse not to find a table or a flat surface other than the concrete street to celebrate the Mass. "What's this? Zen Mass? Was it necessary to have Mass celebrated at Luneta? 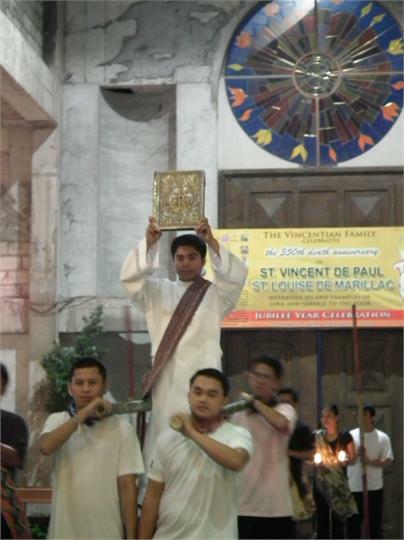 Radyo Veritas celebrated Mass. Why did the priest not borrow the table used as an altar by Veritas? Mass is offered on a consecrated altar. That is the street for crying out loud! 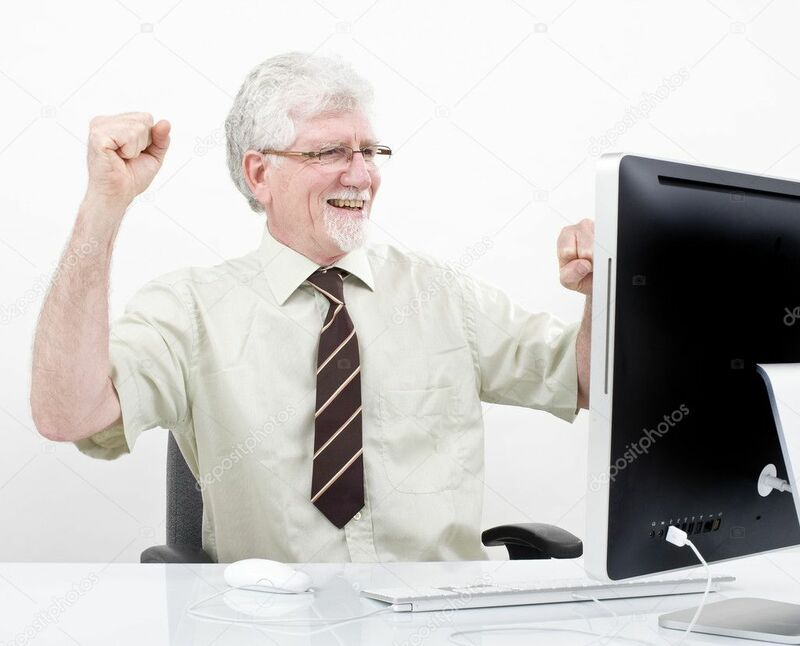 Don't show me photos of priests celebrating on the hood of jeeps because those are war time photos! The country is not in a state of war! If there is a need to offer Mass for the intentions of the rally, why not celebrate it in a church or chapel or on a consecrated altar before joining the rally? This priest really does not have a sense of the sacred! Why do we even consecrate an altar in the first place??? The Mass is disrespected and we just do whatever we want to do with the Blessed Sacrament! 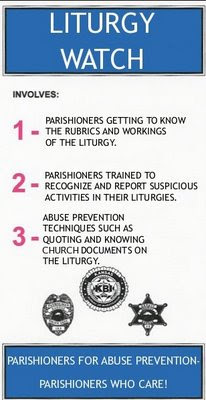 Lovely fruits of the liturgical reform of Vatican II!" We have really lost the sense of the sacred. You'll never see this thing happen in this form of the Mass. I am not saying that this abuse is allowed under the current rubrics, but the inaction of our bishops to correct liturgical abuses legitimizes the abuse and makes it the norm rather than an aberration of the law. But show me a TLM celebrated this way, under the same conditions in peace time, if you can show me one...I'll shut down this blog for a whole month! Because everybody has a price! Vatican City, Aug 23, 2013.- In one of his last acts as Pope, Benedict XVI approved changed wording in the rite of baptism which emphasizes “the Church of God” as the community into which the baptized individual has been incorporated. After having baptized a child, the minister will now receive him, saying, “The Church of God welcomes you with great joy,” according to a Feb. 22 decree of the Congregation for Divine Worship signed by Cardinal Antonio Cañizares Llovera, prefect, and Archbishop Arthur Roche, secretary. The change took effect March 31 in the Latin typical edition of the baptismal texts, and is to be implemented in future vernacular editions. According to the decree, Benedict XVI established the change during an audience with Cardinal Cañizares held Jan. 28. The decree was recently published in “Notitiæ,” the newsletter of the Congregation. Prior to this year, when Benedict XVI celebrated baptism in Italian as Pope, he had omitted this “our,” conforming the Italian he pronounced to the Latin typical edition. Our liturgy has become too anthropocentric, man-centered, always the "Me" "You" "Us" that matter. The liturgy which lifts our heart and souls to God, was re-engineered to bring our senses to one another. We have so much ambiguous terms in the liturgy the one who hears it need too much "re-catechism" just so that the Catholic does not get confused. Example? How about the new translation of the Missal? Liturgiam Autheticam, the Instruction which started it all said "the original text, insofar as possible, must be translated integrally and in the most exact manner, without omissions or additions in terms of their content, and without paraphrases or glosses. Any adaptation to the characteristics or the nature of the various vernacular languages is to be sober and discreet." 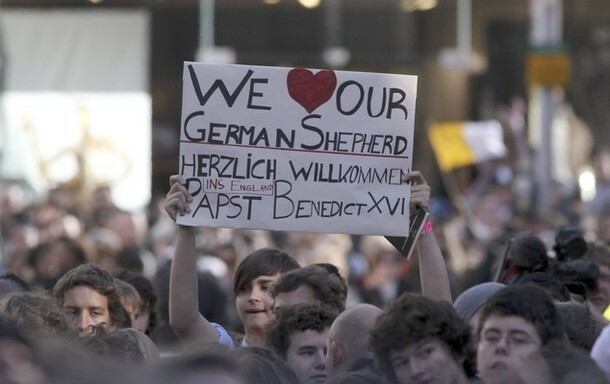 One of the reasons again why I love Pope emeritus Benedict XVI. For some ego maniac like, Celdran, that hurts. And then you can see the whining go on. Actually, when I saw this photo, I was not surprised at all. Publicity whore will remain publicity whore. And then he has the audacity to tell a good Catholic how to be actually a good Catholic. Like a Christian missionary in Mindanao teaching a Muslim how to be a good Muslim. To wrap up, this was my first impression when I saw the photo. 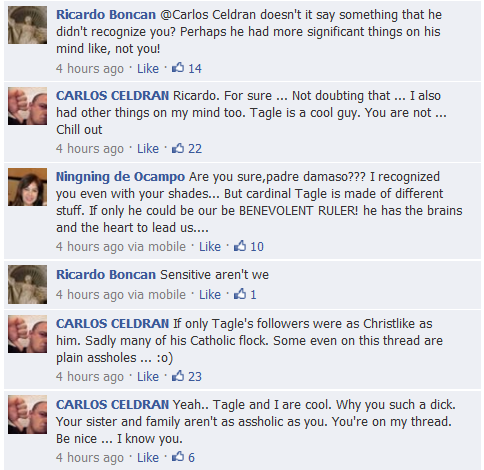 The blocking of Celdran and the cardinal was impeccable. Super like this, plain and simple. I almost shouted "Fuego!" LOL! But I'd prefer them to be posing here. Perfect place for their advocacy. 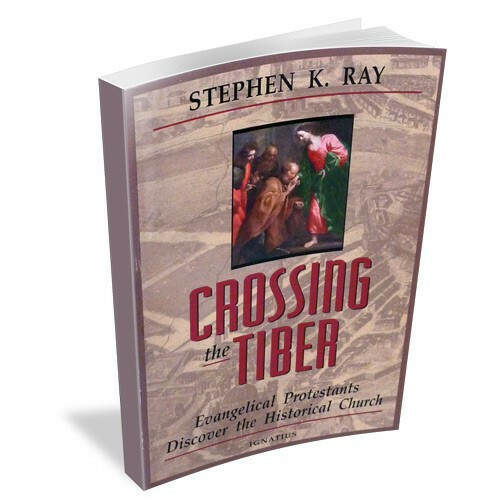 They are a danger to the Faith and they attack relentless the moral authority of the Church. FYI: One of the rabid groups during the RH debates that benefited from pork barrel money. Another great, no nonsense, no Mickey Mouse gloves confrontation of lazy, conformist bishops of the US from Michael Voris! 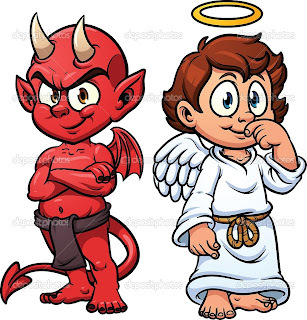 He debated me about my attitude of calling out liberal priests and bishops for their sins of commission and omission. He said that I am sinning for publicly criticizing the bishops, because they are the successors of the apostles. Well, I thought if Judas Iscariot were alive this self-centered feel-good, pseudo-defender of the Church, who really cares nothing but his own self-loathing megalomaniac public image, would defend Judas Iscariot and would definitely be one of those who on a Sunday shouted "Hosanna!" and on Friday shouted "Crucify him!". There are priests like that who think that making people uncomfortable by telling them their errors is an un-Christian way to do it. The Vortex is one of those programs that inspires this blog to continue doing what it does. CALLING OUT ERROR. And yes, I can take it too if someone calls me out. 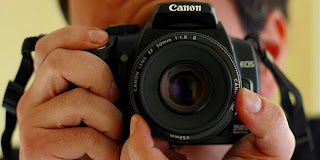 Followers of this blog are growing daily, and they contribute DAILY. And you cannot hide the errors you commit. And for that megalomaniac bloggger...check your ego. The real reason why you love your blog is not because of the apologetics. It is because of the attention you are getting and the free meals and tickets that go along with it. I know a lot about your whims. What you do does a great dishonor to what you are wearing! God really told your superiors to check on you. And you listened instead to your ego. PS: This megalomaniac poor excuse for a blogger called Michael Voris a Rad Trad. Mike will get that screencap. I promise you that so this ego-tripper won't have a photosession with the famous host of the Vortex. GULP Alert: Priests don't own the Mass!!! This is from the album of Rev. Fr. 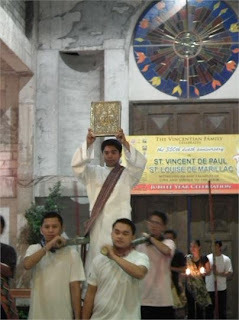 Greg Vega of St. Andrew Parish, Candaba, Pampanga. I feel so nauseated thinking of how these poor girls were made to look like they were a bunch of vestla virgins. No. This was not during the girls' first communion. Our GULP agent said that this is a staple of Sunday or fiesta Masses of Fr. Greg. Wherever he got this idea, I don't know where. San Beda or PIL in Bukidnon, perhaps? All the marks of active participation and gender equality written all over it. And can you see women wearing the scapular like "stoles" of the EMHCs? Why have the same one as EMHCs? Because women can't be EMHCs so they need an EQUAL garb. I'm still nauseated with these priests who think they can just do whatever they want in the Mass. 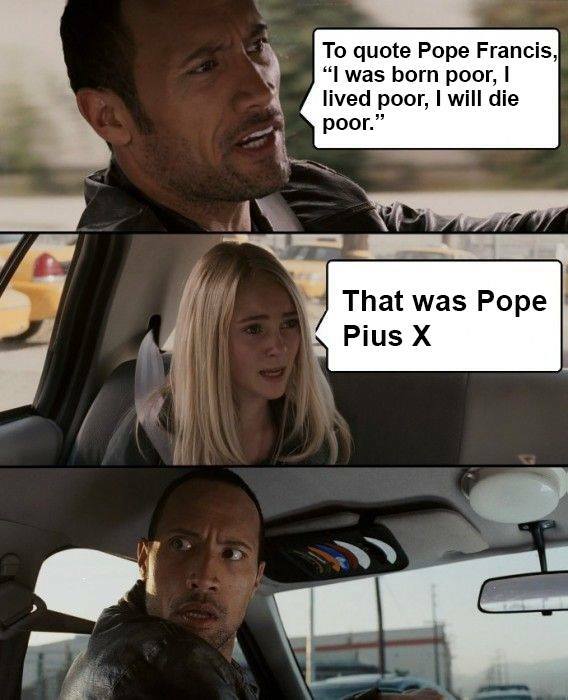 As if THEY OWN THE MASS! If a lay person supports that priest, and attends the Tridentine Mass, he is a sedevacantist and an SSPX supporter. And if a blogger does all of that, he is branded a secret SSPX! That is why we have people like this. When you mention St. Pius X, they think you are already of the group. JP2 and J23 Canonization date will be revealed on Sept. 30! In a presentation on Saint Giovanni Battista Piamarta held in Rimini, Cardinal Angelo Amato, prefect for the Congregation for the Causes of Saints, confirmed that Consistory that will announce the date of Canonization for John XXIII and John Paul II will be held on September 30th. 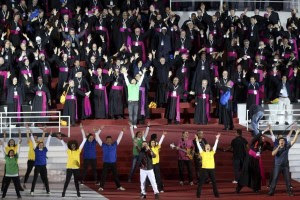 In an interview with Vatican Radio, Cardinal Amato reiterated the Holy Father’s words during his press conference held on his return flight from World Youth Day in Rio. “On the airplane, the Holy Father, who was returning from Brazil, already announced that their Canonizations will not be imminent - in these last months of 2013 - but in 2014,” the Cardinal said. Cardinal Amato regarded them as two pillars not only of Christian culture but of Christian holiness as well. And Sept. 30 is the day of this other great guy! And I think the date of the announcement has some significance with the feast of St. Jerome. Not only was the saint known for his work on the Vulgate, but he is a Doctor of the Church. So, I think the pope has something on his mind when he decided to hold the consistory announcing the canonizations on his memorial. That is the same left-wing political party, masking as a party of the marginalized, that has continuously benefited so much from this current presidency. And this is the same anti-Catholic organization that continues to attack the Church! If anybody knows who makes this image of our new Saint, please PM me and I will promote you in the blog. I get a lot of inquiries. I am sneaking in a few minutes while working for relief and rescue efforts because of the monsoon rains. And just like in Habagat of 2012, MOSTLY Catholic institutions and Catholic men and women are in the forefront of helping the victims of the rains. I looked and looked if they were helping. And this happened to me....AGAIN! The Filipino Freefarters have a lot of reality check to do. I guess their science and mathematics cannot change the fact that when the human spirit is needed the most, even they cannot show their spirit. Because they do not believe in anything SPIRITUAL. And they have the nerve to ask the Church to help! Spoiled brats will always be a bunch of whiners. 23 reasons why a priest should wear his collar. PS: I can state 100 reasons why the laity SHOULD NOT wear the clerical collar. 1. It's called a CLERICAL collar. Only clerics wear it! Where is stated in the Bible that when ordaining, the one being ordained should kneel? The Iglesia ni Cristo is nothing but an organization full of lies, deceits and greed for power and money. AKA...........the biggest Masonic Lodge of the EARTH! 100 years of fraud and deceit. My friend sent me this one. My reaction would be different. Actually, this is what I'll be doing. 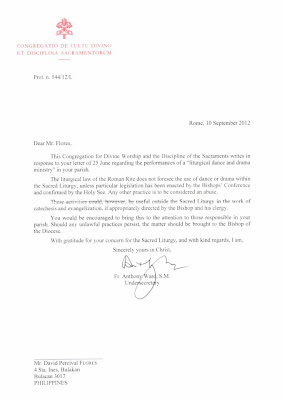 I have printed and given this document to all those who promote liturgical dance and I left them only with one question, "On whose authority, higher than the Holy See, do you do that liturgical dance?" Will Msgr. 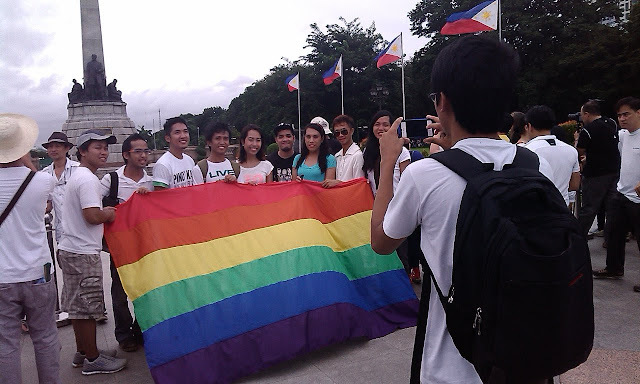 Arnel Lagarejos protest this? Will any of those people tell the Pope, that what is important is in the heart and not the dress! Now if there is a dress code when simply entering a sacred place for just being a tourist, why won't there be any dress code when you attend a HOLY EVENT? Are you still looking for excuses? GULP Exam: Can this possibly happen? Can you receive Holy Communion and then at that moment NOT receive Holy Communion? Don't answer in the Facebook account of TPC. Post them here. Note: Nothing profane was done to the Eucharistic Lord. 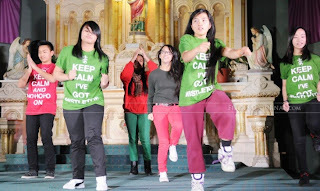 GULP Alert: The t-shirt says "Keep Calm"
HOW CAN I KEEP CALM?!?!?! Why not outside the church??? Don't you know what is sacred anymore? 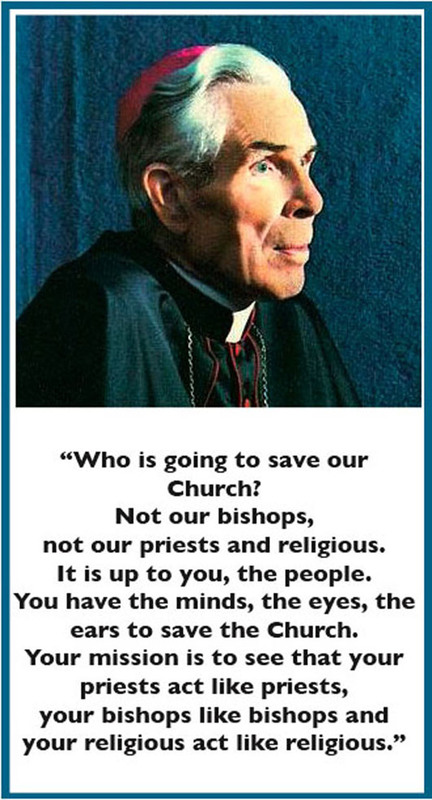 Like the poster below that the Archdiocese of Manila produced, it is nothing but COMMON SENSE and PROPER BREEDING. Dress appropriately for the right occasion. You don't have to be a monsignor to know that. Msgr. Arnel F. Lagarejos, Oeconomus of the Diocese of Antipolo, Parish Priest at Our Lady of Light Parish. And that is a screen cap of his post on his Facebook account. The LORD said to Samuel, "How long will you grieve over Saul, seeing I have rejected him from being king over Israel? Fill your horn with oil, and go; I will send you to Jesse the Bethlehemite, for I have provided for myself a king among his sons." And invite Jesse to the sacrifice, and I will show you what you shall do; and you shall anoint for me him whom I name to you." Samuel did what the LORD commanded, and came to Bethlehem. The elders of the city came to meet him trembling, and said, "Do you come peaceably?" And he said, "Peaceably; I have come to sacrifice to the LORD; consecrate yourselves, and come with me to the sacrifice." And he consecrated Jesse and his sons, and invited them to the sacrifice. 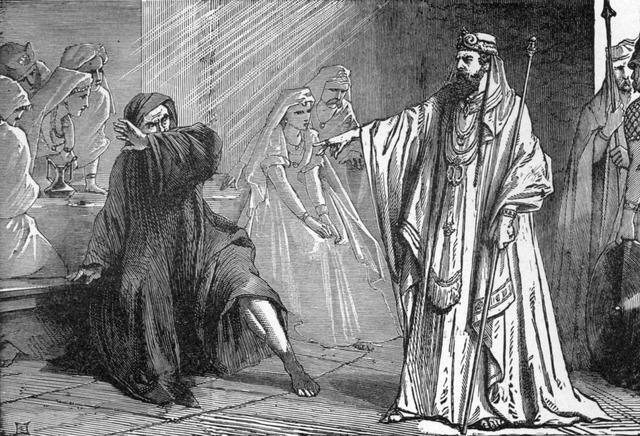 When they came, he looked on Eli'ab and thought, "Surely the LORD'S anointed is before him." But the LORD said to Samuel, "Do not look on his appearance or on the height of his stature, because I have rejected him; for the LORD sees not as man sees; man looks on the outward appearance, but the LORD looks on the heart." Then Jesse called Abin'adab, and made him pass before Samuel. And he said, "Neither has the LORD chosen this one." Then Jesse made Shammah pass by. And he said, "Neither has the LORD chosen this one." And Jesse made seven of his sons pass before Samuel. And Samuel said to Jesse, "The LORD has not chosen these." And Samuel said to Jesse, "Are all your sons here?" And he said, "There remains yet the youngest, but behold, he is keeping the sheep." And Samuel said to Jesse, "Send and fetch him; for we will not sit down till he comes here." And he sent, and brought him in. Now he was ruddy, and had beautiful eyes, and was handsome. And the LORD said, "Arise, anoint him; for this is he." The passage talks about the choosing of the new king of Israel. The Lord instructed Samuel to anoint one of the sons of Jesse, who we know as David. And his instruction to choosing David was what the monsignor cited. QUESTION: Was the Lord even talking about dressing up for worship? The Lord reminded Samuel that he chose David not because of his looks but because of his heart, something which in not in Saul anymore, that is why the Lord chose David to be the new anointed king. When you read some of the comments in the monsignor's post, they were even talking about what is in the heart is more important. Well of course, they'd draw a conclusion from that simply because the monsignor was implying that! Which leads me to ask: Are we are even talking about what is in the heart?! Topic is about properly dressing for Mass. Who what was the talk about what is in the heart? 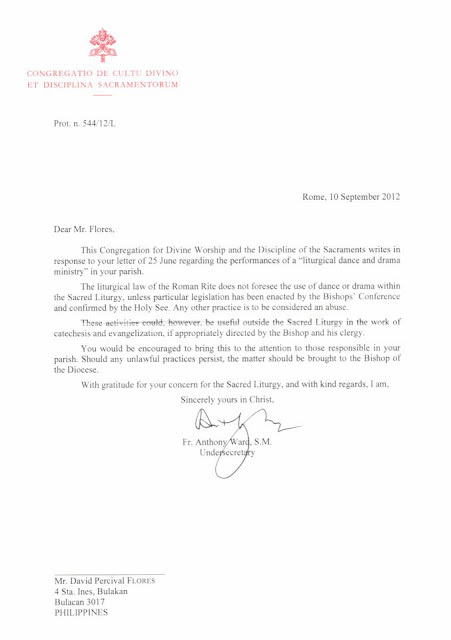 So sinners are not allowed to go to the Lord at Mass??? While he did quote something from the Bible, I think the monsignor does not even want to talk about what St. Paul wrote in 1 Corinthians 11:2-16 about headcoverings for women while worshiping and how to dress modesty as stated in 1 Timothy 2:9. Yeah I think he forgot about those. He stuck to the Old Testament quotation that is obviously taken WAAAAYYY out of context. Oooh! He forgot about the rigid rules about garments in Leviticus. Take a look at the poster once again. The poster does not even say it is a requirement. 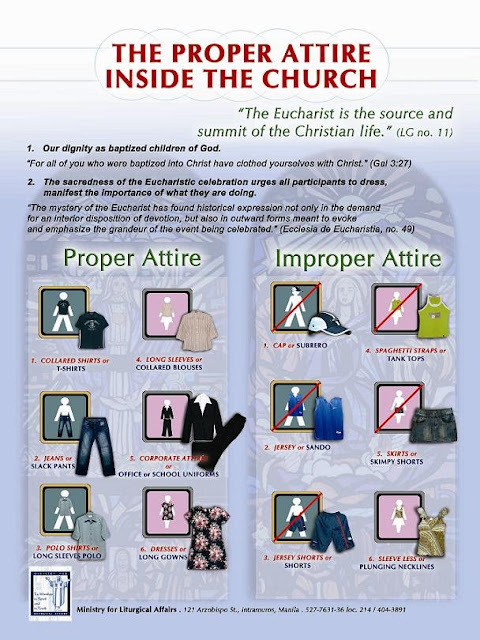 It is a catechesis to teach people to dress properly. 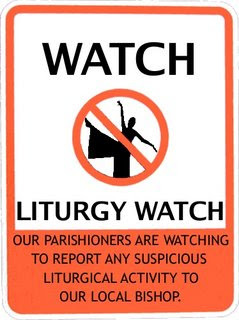 I have lamented about this in my numerous posts in the past as it became one of those usual parish announcements in the parish billboard that get flooded. I always thought that for an effective catechism to work, printed materials are not enough. We need someone to do the actual TALKING for the posters. Posting them just aint enough. 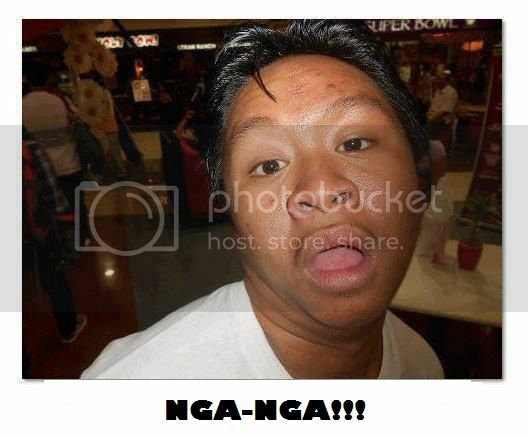 You know what sets us apart from the other denominations and sects like the Iglesia ni Manalo? They know when to dress properly. The members are "forced" of course, but they have been properly taught as told to me by my INM friends and they know the biblical texts and even surprisingly practical reasons why they should dress properly when worshiping. After the 70s, there is no such thing as a Sunday's best anymore. 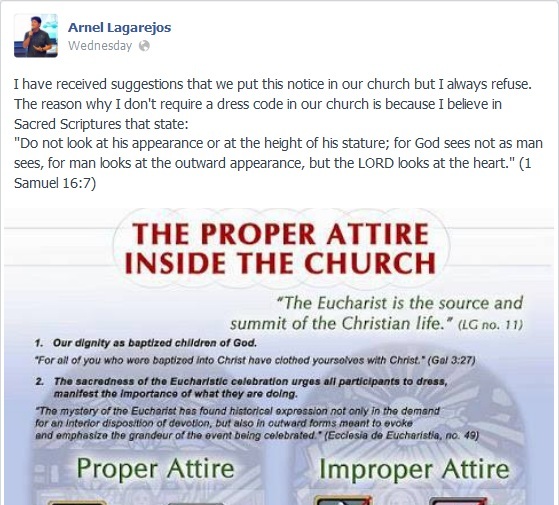 Dear monsignor, was the Church forcing the issue of properly dressing up for Mass? Or all this talk about proper decorum boils down to this: ETIQUETTE. Is it a rare commodity these days? Here is photo from Orbis Catholicus Secundus. 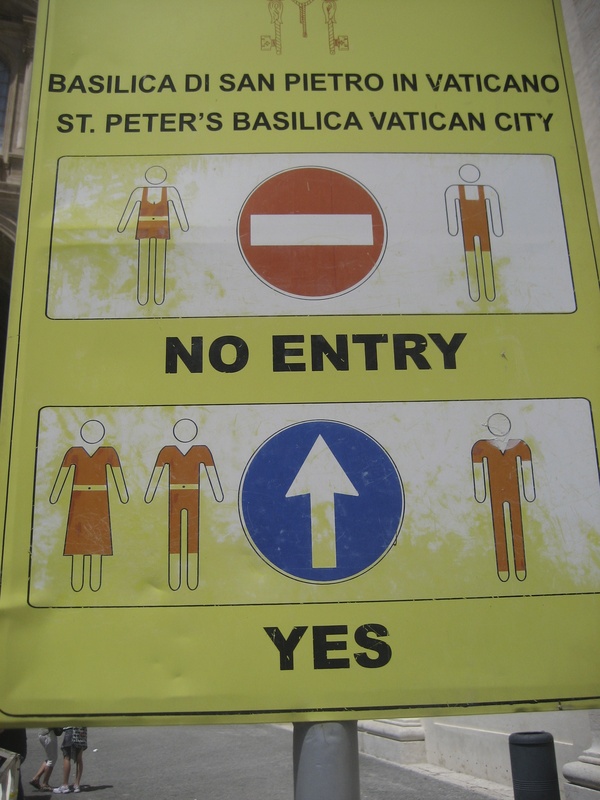 It is a sign in a chapel in Rome. This is just a simple sign but it says a lot. Imagine the RCAM poster even has illustrations on what is proper and what is not. What bothers me is the monsignor would definitely be sending the wrong signal by publicly posting his opposition to the simple reminder to dress modestly when going to church. It is a different story if he just refuses to post it. He publicly criticized the catechetical poster by quoting a Biblical text OUT OF CONTEXT. What does he expect to get out of it? More people of good heart to come to church? I think people of good heart, KNOW how to dress properly and how to act decently when at church. Quite interesting that Christ used the imagery of a man not properly dressed for an important event getting a violent treatment because of it. By the way, the king in the parable did not look at the heart of the wedding guest. The Misa ng Sambayanang Pilipino of the late Benedictine monk Dom Anscar Chupungco sat in limbo in the Vatican. It did not get the approval of Rome. That type of Mass is full of Filipino inculturation that it would be more Filipino than actually Roman, a completely different Mass! 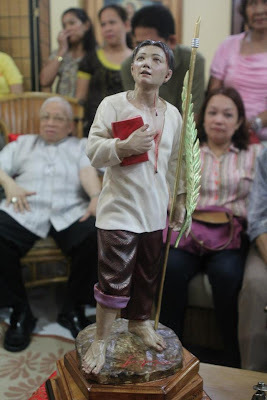 This is the Misa ng Sambayanang Pilipino. No wonder it is not approved. Make you deacon ride like Cleopatra! Or use Petromax instead of candles for torches since it is uniquely Filipino. And hey, look! 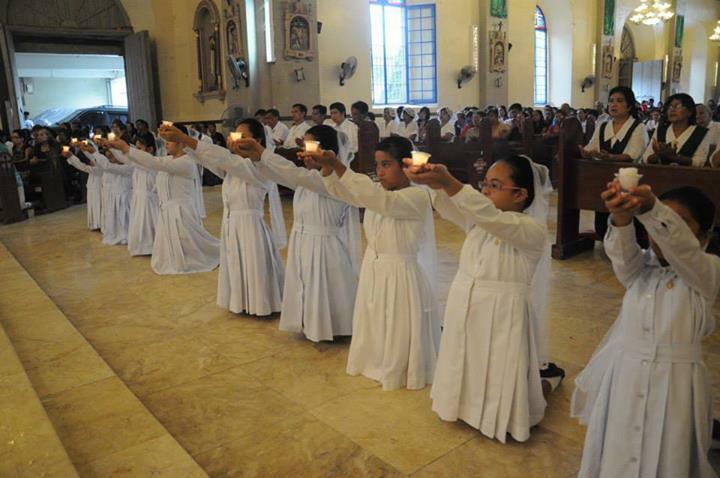 Pinoy vestal virgins offering incense! Why are they doing it without approval? If you do something not legal, what do you all that act? I have never seen that priest-blogger comment anything against Liturgical Abuse. He is a liturgical abuser himself! 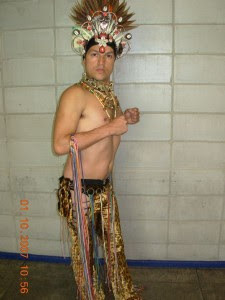 This is no other than the choreographer of the World Youth Day in Rio. He posed naked in several gay magazines in the past. 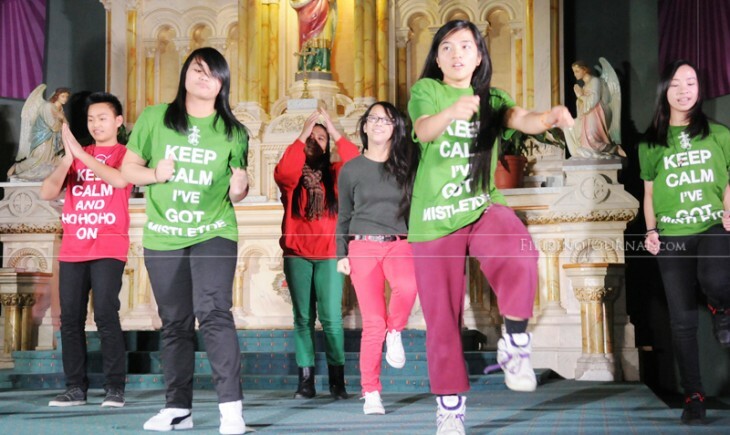 Is he the only capable choreographer available to be brought in for World Youth Day? Judging on the English of the post, it is based on Google Translate, not Orthodox Patriarch English Murderer Translate.